Is Exchange User Out of Office? Finding Users Who Have "Out Of Office" Enabled In Exchange 2010 describes how to use PowerShell to determine if a user has his/her out-of-office setting enabled. However, it requires the use of the Exchange Management Shell. Is there a way to do this without installing (additional) dependencies? Compose an e-mail to that user. When Outlook resolves the name (or e-mail address) to the Exchange account, any Automatic (Out Of Office) Replies will show above the "To:" field. Not the answer you're looking for? Browse other questions tagged microsoft-outlook powershell exchange powershell-3.0 or ask your own question. Is it possible to grant inbox delegation to a user, but filter what the users sees? 2 Factor Outlook accounts in OSX Mail? 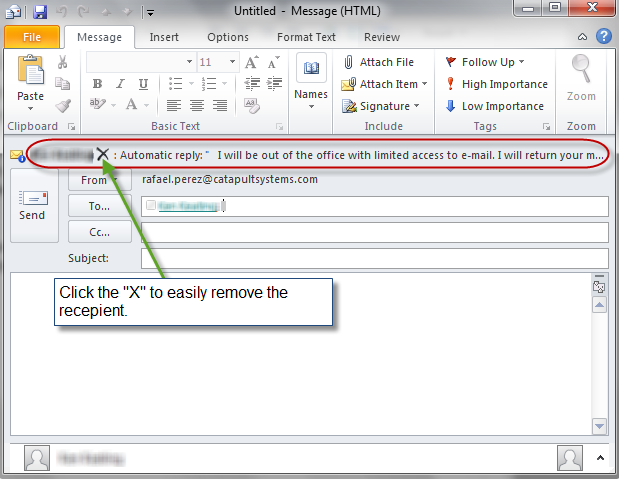 MS Exchange and Outlook - how to find all outgoing mail for an account.NOT setup in outlook?